The Azarian McCullough Gallery at St Thomas Aquinas College is pleased to present an exhibition of Creative Technology: Art and the Digital Future through December 18th. A reception is scheduled for Wednesday, November 28th from 4:30pm-6:30pm and is open to the public. The Gallery is open Tuesday, Wednesday and Thursday 1:30-4:30 or by appointment. Systems, connections, conduits. Art in this digital age immerses itself in the networks that allow the movement and transfer of global knowledge and information. Technological changes also provide new tools for self-expression, whether it be tapping into social networks, exploring interactivity or bridging the digital divide. In the 2011 State of the Union address, President Barack Obama set a mandate to ramp up technological innovation in STEM fields (science, technology, engineering and math). That same year John Maeda, as president of the Rhode Island School of Design, initiated the STEM to STEAM movement, campaigning to add “arts” to STEM. STEAM contends that design thinking and creativity are essential components of innovation. Utilizing creative coding and interactivity, artists working in the area of creative technology continue the project-based inquiry long practiced in the art studio. 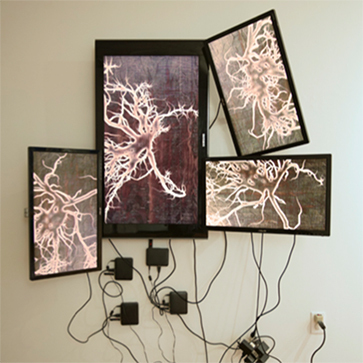 Tech-based art making practices are interactive by nature and are able to expand and explore the role of user input and augmentation. Conceptually, much of this art also delves into questions of global connections and the digital systems, both seen and unseen, that are the information portals of the 21st century world. This group show features the work of James Yuxi Cao, Dahye Kim, Catherine Lan, Jeremiah Teipen, Maciej Toporowicz, Tansy Xiao, and Jing Zhou, and was curated by Nina Bellisio and Catherine Lan. St. Thomas Aquinas College is an independent liberal arts college located on 60 acres in Rockland County, NY which provides education at the undergraduate and graduate levels. The College’s 2,800 full and part time students can choose from more than 100 different majors, minors, specializations, and dual degree programs across three Schools: Arts & Sciences, Business, and Education. The College is recognized by U.S. News & World Report in the Top-Tier for Regional Universities, by Colleges of Distinction in both its New York and Catholic editions, by Affordable Colleges Online as a top College in New York for Return on Investment, and is included as a Military Friendly School®. St. Thomas Aquinas College is accredited by the Middle States Association of Colleges and Schools; its School of Education is accredited by the Council for the Accreditation of Educator Preparation (CAEP); and its School of Business is accredited by the International Accreditation Council for Business Education (IACBE). For more information, visit www.stac.edu.